1 Võro and Seto in southern counties are spoken along with Estonian. 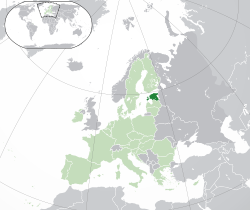 Russian is still unofficially spoken in Ida-Virumaa and Tallinn, due to the Soviet program promoting mass immigration of urban industrial workers from the USSR in the post-war period. 2 ٤٧٬٥٤٩ square کیلۆmetre (١٨٬٣٥٩ square mile) were defined according to the Treaty of Tartu in 1920 between Estonia and ڕووسیا. Today the remaining ٢٬٣٢٣ square کیلۆmetre (٨٩٧ square mile) are still occupied and part of ڕووسیا. The ceded areas include most of the former Petseri County and areas behind the Narva river including Ivangorod (Jaanilinn). 3 Before 2011: Estonian kroon (EEK; 1 EUR = 15.6466 EEK). 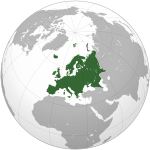 4 .eu is also shared with other member states of the European Union. ئەستۆنیا، بە ڕەسمی کۆماری ئەستۆنیا (بە زمانی ئەستۆنی: Eesti Vabariik) وڵاتێکە لە کیشوەری ئەورووپا. بەپێی ئامارەکانی ساڵی ٢٠١٤ ژمارەی دانیشتوانی وڵاتی ئەستۆنیا ١,٢٨٣,٧٧١ کەس بووە کە دەکاتە ٠.٠٢ لەسەدی ڕێژەی خەڵکی جیھان. تەمەنی مام‌ناوەندی خەڵکی ئەم وڵاتە ٤١.١ ساڵە. ھەروەھا ٧٠ لەسەدی دانیشتوانی وڵات لە شارەکان دەژین. ^ "Statistics Estonia". Stat.ee. 1 January 2011.